California League umpire Mike Rains is the 2017 Doug Harvey Award winner for Cal Lg Umpire of the Year. The award, given annually since 2010, honors the top umpire of the Single-A California League, which is the only league in Minor League Baseball to honor an umpire with a postseason award. 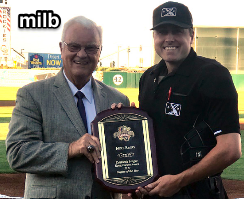 In a ceremony held Thursday in Lancaster, CA before the first game of the California League Championship Series, Cal League President Charlie Blaney presented Rains with the Doug Harvey Award plaque, stating, "Mike is a tremendous worker and is a top prospect. We've been very honored to have him in our League this year. The Cal League sincerely thanks Doug Harvey for lending his name once again to this prestigious award." The California League award for Umpire of the Year is voted on by the league's managers. Earlier this season, the League inducted Harvey into its Hall of Fame following his induction into Cooperstown, furthermore opting to name its top umpire award after him. Harvey was born in South Gate, CA, in 1930, officiated in the California League from 1958 through 1960, Pacific Coast League in 1961, and the National League from 1962 through 1992.